We returned home from Bowling Green today with hardware from Kevin's SIXTH tournament win in a row this summer. The 8 year-old All-Star team went UNDEFEATED. It was pretty sweet! It was a bit bittersweet today watching our younger son play his last (ever) Rookie League game. Goodbye pitching machine. It's been a fun three years. This weekend gave us a few memorable moments: Kevin tagged a slider out at home for a 3rd out. He said it was his best day ever aside from going to Great Wolf Lodge earlier this summer. Kevin was also the final run that determined the championship game this evening. Kevin has a nice selection of trophies and one medal that he's brought home this summer. Fall league baseball starts this week. Bring on the pitching mound! That's a great accomplishment for Kevin & his team! Way to go! Wow, that is awesome!! I know you must be grinning from ear to ear! What an amazing accomplishment for such young players. When he makes it to MLB I can say "I knew his Mother!" ha ha Oh and the comment about Great Wolf Lodge made me laugh out loud. So funny what kids compare things to! How exciting!! 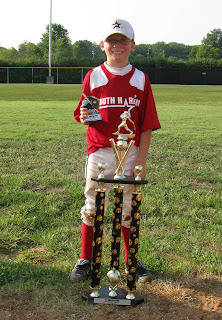 What an fun summer of baseball :) He looks so proud of all that hardware. You'll have to put up a whole new shelf for all of that!